Simprints works with the BRAC aid organization in Bangladesh. Courtesy Simprints. As access to health care has increased worldwide, so has the gap in health equity—both in terms of access and quality of services. The factors contributing to this systemic issue are complex, but what is taken for granted in more developed nations—food availability, clean water and environments, access to vaccines, and preventative care—often meets with insurmountable obstacles. 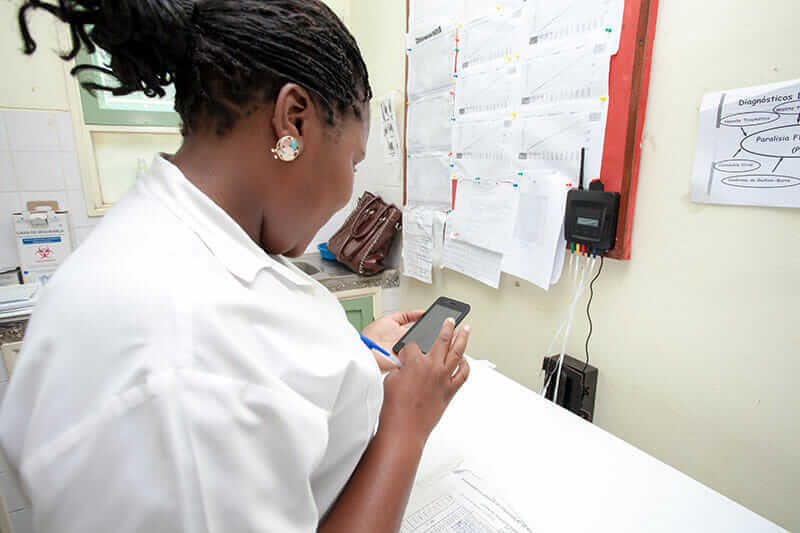 Likewise, technologies that are common in some corners of the world—cloud computing, mobile technology, social media, and the Internet of Things (IoT)—are being harnessed to address health challenges in low- to middle-income countries in remarkable ways. 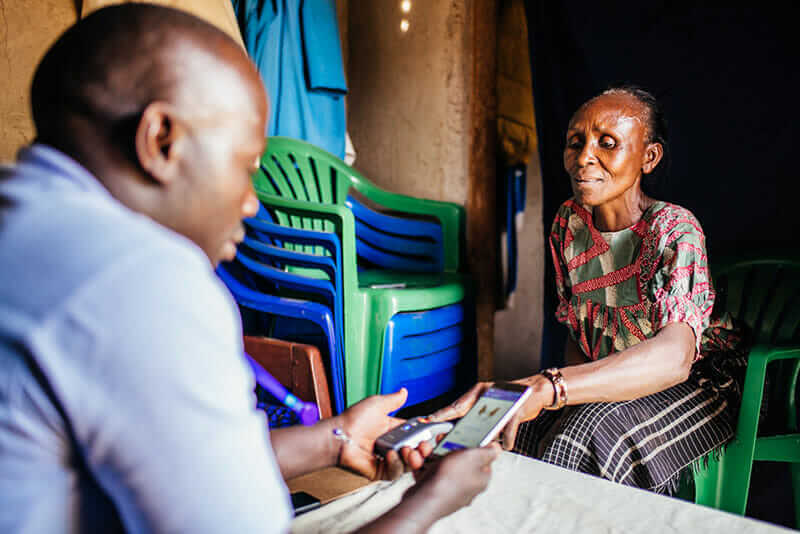 Simprints’ technology, used here in Uganda, gives more precise and effective provision of essential health services in low-resource settings. Courtesy Simprints. IoT refers to “smart” devices that use sensors to gather data and can communicate with each other. As of 2017, 8.4 billion “things” are connected globally. It’s not a huge leap to imagine that equipping health-care providers with smarter tools could help bridge the health-equity gap that spans continents. IoT devices can streamline workflow and aid caregivers and patients on the front lines. Health-care providers are already vaccinating, diagnosing, and treating for preventable chronic health conditions more quickly than ever before, in large part due to the use of IoT technology. 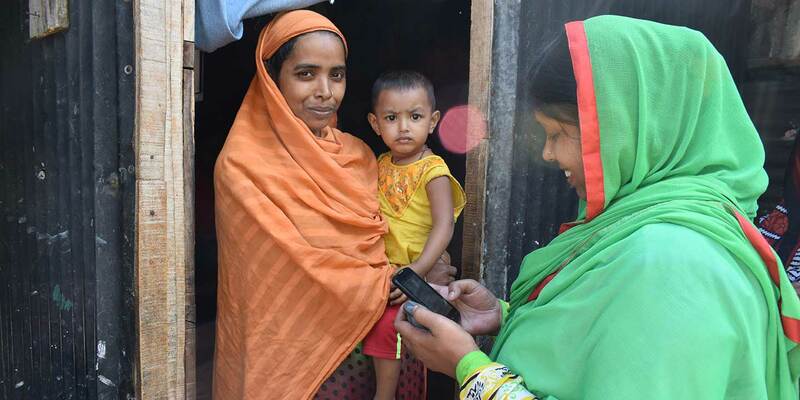 A leader in applying IoT technology to global health is Cambridge, UK–based nonprofit Simprints, which deploys a biometric fingerprint solution in populations affected by climate-related disasters. 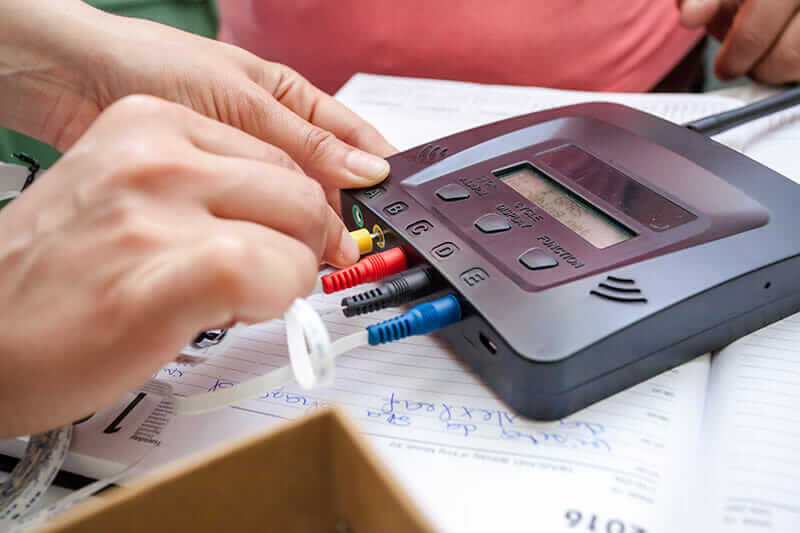 Simprints’ technology enables access to health care and other life-saving services through the company’s ID system, which is tailored for scarred, worn, and damaged fingerprints typical of “last-mile” beneficiaries. When working within current systems, health-care organizations and nonprofits must confirm the identity of the patient and any illnesses requiring treatment, which means accessing accurate health records—with or without a recognized form of ID. Streamlining these practices via the IoT enables quicker, confirmed patient registrations and identification; correct treatment applications; and, hopefully, healthier outcomes. This increases access to basic care, such as prenatal checkups and immunizations. 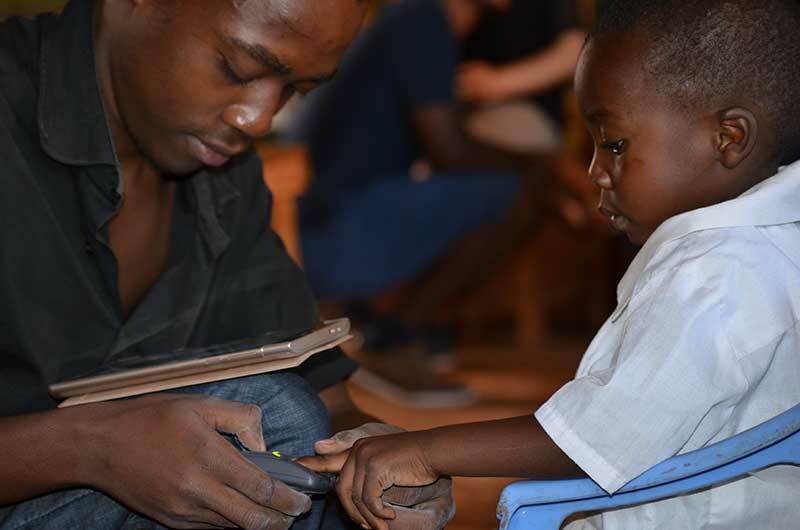 Simprints’ low-cost, rugged fingerprint scanners enable frontline health-care workers to accurately track large numbers of patients in developing countries, such as Kenya. Courtesy Simprints. Another nonprofit, Los Angeles–based Nexleaf Analytics, is focused on sensor and data technologies, with the aim of using the information to improve global health-care interventions and systems. “One challenge facing the global vaccination sector is a lack of visibility into a system’s performance,” says Nexleaf Cofounder and CTO Martin Lukac. One solution Nexleaf offers, a low-cost sensor called ColdTrace, is designed to monitor vaccine refrigerators in rural or isolated areas. Nexleaf’s ColdTrace device monitors vaccine refrigerators in isolated and rural areas. Courtesy Nexleaf Analytics. This directly addresses a common problem—inadequate vaccine storage—that affects the efficacy of both the vaccines themselves and the supply chain, including government bodies and international organizations. Recent World Health Organization (WHO) data shows that immunization prevents 2 to 3 million deaths every year—which could increase significantly if more vaccines could be transported, stored, and delivered effectively. A nurse receives a ColdTrace alert directly to her smartphone. Courtesy Nexleaf Analytics. ACT | The App Association forecasts the connected health-care market to reach $117 billion by 2020. And 40 percent of IoT’s predicted market will come from developing countries, which will require a new generation of health-care solutions. Using data to inform these solutions increases their reach and effectiveness—elevating health care to a human right to be enjoyed by all. Recognizing the urgent need to generate solutions for people working and living in remote areas of the planet, the Autodesk Foundation is helping companies like Nexleaf and Simprints bring radical improvements through smarter, more sustainable design.